The upper air passages refer to the respiratory organs in the head of the human being. They include the nose and throat (pharynx). During breathing in, the air enters initially through the nose, where it is pre-cleaned by a hair filter. A bifurcated network of blood vessels in the nasal mucous membrane warms the air. Mucous droplets from the nasal mucous membrane moisten it as well. This adapts the air to the conditions prevailing inside the lungs (pulmo). 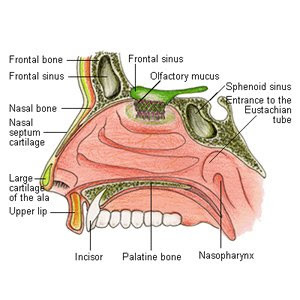 The paranasal sinuses (sinus paranasales), which are connected to the nose, are also involved in this process. Through the nose, the air comes to the throat, which consists of various sections, with the esophagus and windpipe crossing in the medial throat (mesopharynx). The inhaled air passes through the throat to the larynx (larynx) to the lower air passages. In comparison to the sense of taste, the sense of smell can distinguish much more. A qualitative distribution as with the sense of taste (bitter, sweet, sour, salty) is not so simple. Instead, classes of scent are used to express the sensation (pungent, sweaty, rotten, etc.). The sensory receptors of the olfactory organ (organum olfactus) are located at the start of the respiratory tracts and have the size of a dime on the upper nasal wall and the septum. Through colorization (pigmenting) the olfactory region has a yellow color and is thus highlighted against the red membrane. Whether the pigmentation is involved in smelling is not clear. However, animals without any pigmentation (albinos) do not have a sense of smell. The tissue in the olfactory region (more than 10 million receptor cells) is about 50 µm higher than the epithelium of the respiratory tracts. The olfactory cells have very fine hairs (cilia) (up to 12 per cell) and are covered with mucus. Nerve processes connect as a bundle of fibers from the olfactory cells to the front section of the olfactory cortex at the basis of the front brain. The olfactory cells are separated from the olfactory cortex by very thin bone, the sieve, through which the nerve fibers pass through small openings. After appropriate processing of the olfactory information, the smell becomes known. Olfactory cells are chemical receptors, i.e. the stimulus of the olfactory cells is the result of a chemical process on the surface of the hairs. How the molecular reaction occurs, with which hundreds of different smells are distinguished, is unclear. Gaseous substances are easier to smell. A water-soluble property increases the ability to smell because the smell molecules enter the air through evaporation. Its very nice blog and great service.I found so many entertaining stuff in your blog,especially on this post. Keep up the good work. you can visit me in.